For the second year Swedish Pioneer Mission arranged a mission conference in Mullhyttan. The theme was "Vision for Mission." Participants included: Micael & Kristin Lahtinen, David Billström, Patrik Olofsson and Peter Paulsson from Open Doors. - We want to inspire and encourage people of how important it is that the world must hear about Jesus Christ - people at home, in our region and all over the world. We must mobilize believers in our country to do the mission mandate. It is important that we all do our part. Micael Lahtinen, now living in Märsta, preached on Friday evening with passion about how an encounter with Jesus gives birth to a missionary. His wife, Kristin, originally from Kurdistan, challenged the Assembly that it is much more fun to do something for Jesus outside the church than sitting in the pews. "Jesus never sat on a seat, he was always on the move." On Saturday morning, David Billström challenged the audience to be part of the Great Commission. Later that day, Peter Paulsson from "Open Doors" told about their work and about the difficult situation that many Christians are experiencing in the Middle East and Asia. Over 100 million Christians live in countries where they are persecuted for their faith. As an example, he said that still, a year after the violent attacks in Orissa India, the Christians are suffering. Open Doors has offices in 22 countries and has projects in more than 60 countries. The founder, Brother Andrew, first smuggled Bibles through the Iron Curtain in 1955. Today Open Doors delivers one million Bibles each year to persecuted Christians in particular, communist and Muslim countries. The main speaker Patrik Olofsson, pastor from Vetlanda, preached on Saturday night about God's heart; about people, about love for them and then "action". 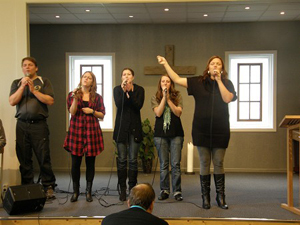 On Sunday, he told about the project "Power House", a successful youth ministry in Vetlanda. He also shared from his own life about how God became his father. When Patrik was only seven years old he lost his earthly father. After this bitterness crept into his heart. But as a teenager God spoke to him directly through a prophecy: "I am your father. What you have missed out earlier in your life, I'll compensate you for." The love of God changed Patrik's life. He received a fire in his heart to tell as many people as possible. Mikael Boman closed the conference, by talking about the importance of the Great Commission.